Cejudo is making all the right moves! Henry Cejudo is inarguably having the time of his life. 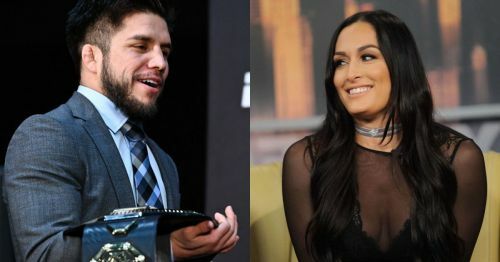 Fresh off an emphatic victory over TJ Dillashaw at UFC Fight Night 143, the UFC Flyweight Champion was on Ariel Helwani's MMA show on ESPN where he revealed his desire of going out on a date with none other than Nikki Bella. The Total Divas star responded positively and was open to the idea of catching up with the Olympic gold medalist to learn a few moves in the gym. That's not all, she even entertained the prospect of going out for a few drinks with the king of the 125 lbs division of the UFC. The Messenger pulled off one of the biggest upsets in recent memory when he knocked out UFC Bantamweight Champion TJ Dillashaw in 32 seconds at the recently concluded UFC Fight Night 143 in Brooklyn. As for the former 2-time Divas Champion, Bella is relishing her time as a single woman ever since she broke up with John Cena. While dating a wrestler sounds like a tried-and-tested formula, Bella could expand her horizons as she accepted Cejudo's date offer. Bella was keeping tabs on Cejudo's interview with Helwani and put out a message as soon as it got wrapped up. The WWE Superstar first congratulated the Flyweight champion on his win and implied that she may have been his lucky charm as the two bumped into each other on a flight leading up to the fight. She then expressed her excitement at the prospect of one day, training with Cejudo in Arizona and maybe, going out for a few drinks after he teaches her some moves that she could incorporate in in-ring return to WWE. She concluded by saying that she intends on sending a bottle of Belle Radici wine to help Cejudo celebrate his successful title defense. Whether the adorable interaction between Bella and Cejudoa actually leads to a substantial romance is anyone's guess. Nonetheless, the unlikely connection between the UFC and WWE star has gotten the social media faithful talking.